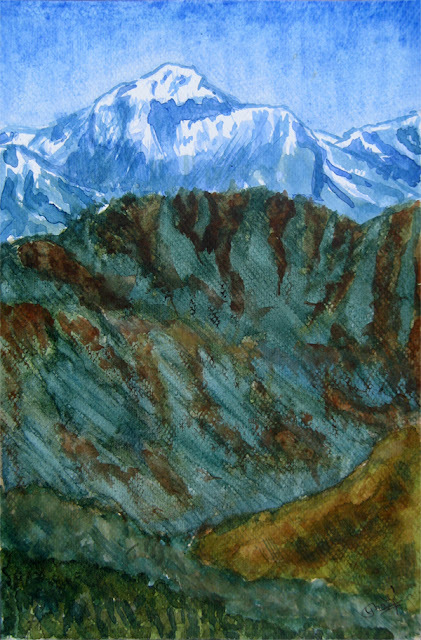 The painting of mountains are really very easy for the beginners and hence these can be the starting point to start painting. However, they are equally popular with professional artists because you can always have a better painting of a mountain and the best ones I have seen are the paintings kept for sale in Thamel, and Hanuman-Dhoka Durbar Square Area in Basantapur. You can find a varieties of mountain paintings there. Some are just plain paintings while those I like the best are of evening sights, in yellow and orange colors with purple sky. I made this painting by using the acrylic colors. The good aspects of the acrylic colors are that they look very bright. However, it is difficult to rectify errors if anything goes wrong. This is the painting of Mt. Ama Dablam which lies near Mt. Everest, the world's highest peak. I was inspired to draw this one too by seeing the black and white paintings in Thamel. There are many inspiring artworks at display in the art galleries of Thamel. 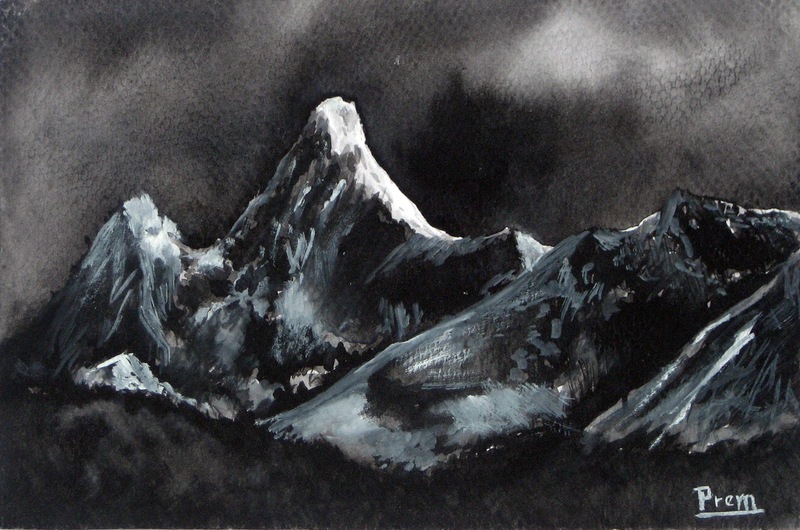 I saw some monochrome paintings of mountains in Thamel and became eager to try one for myself. I finally came up with this work and I have got good comments for it as well, probably because of its unique style - I guess. This painting is my imaginary work. This is the first painting I made in French Cartridge Paper and I immediately fell in love with the paper. You can see its texture clearly on the sky part of the picture. It's texture, thickness and brightness are it's distinct features which set it apart from normal chart papers. I found this paper perfect for doing watercolor paintings. The painting below is one of the paintings which I didn't publish earlier thinking that it wasn't good but recently I thought I should reveal my bad works as well because that can be motivating for the beginners. So, I published it as well. This painting is of Mt. Dhaulagiri, which is the Earth's seventh highest mountain at 8,167 meters from the sea level. This mountain lies in the Himalayas in Nepal. I painted this mountain from a postcard picture. While trying to paint it, I couldn't handle the watercolors well because of the lack of experience. So, I became frustrated and started painting it haphazardly just to finish the paint I had mixed. I already knew that this was going to be a waste. This was saved just because of my love for the Cartridge paper I had just bought. I hope you enjoyed reading my post and viewing my paintings. I hope to know your views in the comments below. I appreciate your critique!! Thanks for your true words. I hope to improve with practice and over time. Thanks a lot anyway.